BTC - Next week members of the House and the Senate will be hearing from broad based coalitions about the effort to stop the continuance of national ID card programs. 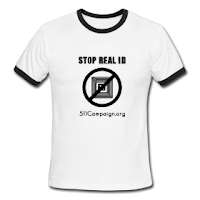 There have been many strong attempts to repeal Real ID and ban national identity. There is the perennial HR 220 - a comprehensive ban on all forms of national ID introduced every session since 2003, authored by Representative Ron Paul. In 2009 Rep. Cohen introduced HR 3471, which would effectively repeal the Real ID Act and replace it with a negotiated rulemaking process. The passage of SB 1070 in Arizona opened a pandora's box of problems associated with racial profiling, nativist identity and forsaking common sense American Constitutional values for "Your Papers Please!" It snapped the knob off at high volume for border security concerns and anti-Mexican frustrations began to boil over. The law burns gun owners and other American citizens now risk running into escalated problems with law enforcement. The law also muddles lines positioning local police to enforce federal immigration laws, leaving the police departments vulnerable to financial bankruptcy from successive lawsuits based on enforcing immigration law. 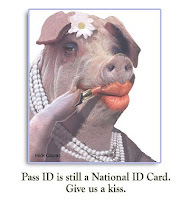 Constituents living in States who passed laws or resolutions opposing national ID card programs are considered "the silent majority" by friendly lawmakers. This is why it is important to speak up now and make yourself heard. Don't fail America's future by staying silent now. Please take time now to find your congressional leaders @ Congress.org . Unless you speak up, you will live with some version of "Your Papers Please!" FLOGGER: DHS to States- "Pleeease spend this money!" Here’s a window onto the upside-down way government spending works. The Department of Homeland Security has sent a letter to states begging them to spend federally provided money on implementing REAL ID, the national ID law. That’s right: Tough budget times make it imperative to spend more money. States don’t want to implement REAL ID, and the American people don’t want a national ID, but the DHS bureaucracy is rattling cages to try to get money spent purely for the sake of spending. It’s flabbergasting. BTC - Two activists from the Fully Informed Jury Association or FIJA were assaulted and unlawfully detained by federal agents agents while video taping an outreach effort on public property in Allentown, PA. Their video equipment was aggressively seized by the agents as bystanders witnessed the altercation. According to the Libertarian Examiner, the interaction escalated as one FIJA member "chose to argue" with a female US Marshall. As 911 report followed, dispatched as a "robbery in progress". The camera operator, George Donnely, has been detained since the incident. The charges to continue to hold him in a local Federal Detention Center are obscured. DENVER - Web cameras make it easy to keep in touch with far away friends and family. If you have a web cam on your home computer, laptop or even your cell phone, a hacker can be lurking, just waiting for a chance to gain control. "The bad guys go out there and find vulnerabilities in different applications and programs," says Michael Gregg, COO of Superior Solutions Inc.
Once you click on it, your computer is overrun by the hacker's program. "When the hackers find a problem before its fixed, its called a Zero-Day or IE-Exploit," says Gregg. THERE'S STILL A LOT OF COVERAGE!! SB 1070 drama continues as more protestors were arrested. This time it wasn’t anywhere near Arizona - it was Los Angeles. Protests are ongoing in Arizona. 5 more people were arrested; this time over Don't Ask Don't Tell at Senator McCain's office. Speaking of protest arrests, Amy Goodman is now suing the city of St. Paul Minnesota over her arrest at the RNC. That was an obstruction of real journalism. I recall over 130 accredited journalists were arrested during the 2008 RNC . Many citizen journalists were also arrested and had to deal with bail and charges out of pocket. TruthOut found gaps in the journalism shield laws which didn’t protect their rights. Bloggers, like Gizmodo editor Jason Chen, aren’t covered. Chen’s home was raided last month over the search for an iPhone prototype. A hearing is scheduled this Friday to sort out what is legal or illegal search and siezure of a blogger’s workplace - which, typically, is their home. We are talking a batched violation here of both 1st and 4th Amendments if Apple and the Redwood City PD are wrong about this. IF YOU MISSED IT: A Miami TSA employee lost a lot more than his personal privacy due to an airport body scanner. The TSA agent became angry over a derisive comment made about the size of his "junk" as he passed through a body scanner. He then assaulted his co-worker and went to jail. As always please share the information you find on BeatTheChip.org with others on the net. It’s just a very sad sad reality that Facebook has gone from friend to Facecrook. Stolen and bogus webprofiles are being sold now on the black market. The depth and breadth of the privacy violations caused me to cut short our 20 day evaluation period of their webservice. This years Privacy Camp in San Francisco was little more than a succession of support group circles given tasks on how to deal with the betrayal of our basic trusts as consumers using what I will call now Facecrook. Even if I do have to pay for Ning - I’m already feeling the pains of separation. One condolence coming out of the Center for Democracy & Technology camp is a step by step method to put Facecrook on a privacy lockdown. It’s about 33 steps. Please take them if your not strong enough to leave Mark Zukerberg’s technology. Our decision became crystalline to delete our profile as it was carefully explained to me that we are "paying" for free services by allowing them - knowingly or unknowingly - to sell the transactional information we give them while using their service. Since I'm almost violently against surveillance I'm not going to volunteer up for it for free, when I know better. I've seen a lot of hit pieces on FB but I think what really did it in for me was when I saw vitaminWater's :::connect flavor, a smart beverage partner with Facebook with the the image of a fingerprint on it. The first words on the bottle's product description were accusatorial and predatory: "We caught you. Your fingerprints are all over this bottle." It was then I decided with finality I would delete ALL of my Facebook accounts. Special effort award: San Bruno for counting the cost ahead of time and heading off Redflex at the pass. They won’t be signing up for the radar any time soon due to expenses. They performed a preliminary audit - a strategy which is working very very well for the Bay area to opt out of more undue surveillance. BTC - Does the following statement sound like some version of you? If so, it's time to recognize there's not a separate chip for immigrants or American citizens. The government does not discriminate who gets a chip, even if you do.